The property page is an additional page in the properties of a MP3-file. It is not limited to only one MP3-file, but you can select multiple MP3-files, or even scan whole directories. If you select a playlist-file (with the extension .pls or .m3u) then the information about the files in the playlist is displayed. 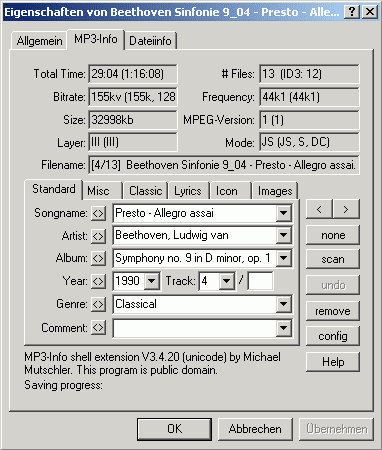 The upper part of the propertypage displays some general information about the MP3-File. In fact it is the information about the MP3-bitstream. You can edit all the data shown here. Additionally you can copy a field to all the other files you have selected, so you don't have to enter the same data multiple times. (the '<>'-buttons). Another feature is the searching for MP3-files, when you shift-click on items in the drop-down lists of the specific field. They hold all the different information about all the MP3-files selected. The Clipalbum-button is more than a simply button: it displays the last action executed. You get a list of actions, when you right-click on this button. Actions are simple scripts, which generate text-output into a file or the clipboard. If you generate the output in a file, then the file is executed as if you did a double-click on it. I.e. if you make a ".bat" file, you can for example make a rename of the files. Or you can generate data-files with the information seperated by a TAB. You can easily import this kind of file in a spreadsheet-application. The scan-button analyzes the filename, and adds the values to the ID3-Tag, if the corresponding fields are empty. Useful for updating some empty info-fields. It depends on regular expressions, so you can generate your own template for scanning the data.